Energy supplements that really work! We combine Ga – Adrenal for energy and adrenal support while Adaptogen tonifies and helps repair the Endocrine system and Neurotransmitters. 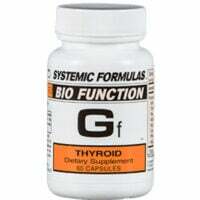 Can be combined with Gf-Thyroid if you’re not on thyroid medication. Adaptogens help your Pituitary and Hypothalamus handle incoming stress better, managing how you respond to stress. They don’t provide energy – they protect how you use your energy. 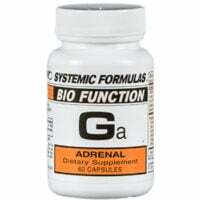 Ga – Adrenal rebuilds adrenals and provides gentle energy support. Take daily for several months for best results. Energy supplements that really work. Adaptogen repairs and tonifies while Ga-Adrenal gives gentle energy and adrenal support. Recommended Usage Ga – Adrenal: 1-2 capsules up to twice a day. One in the afternoon is a great help for fatigue. It won’t make you speedy, just feel better! Our top seller. 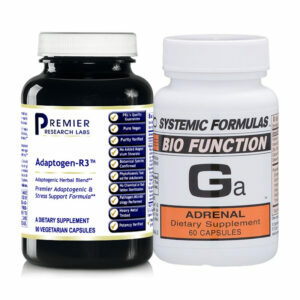 Read more on Ga – Adrenal here. Ingredients: RNA/DNA Adrenal Tissue Factors; Echinacea; Vit. C; d-Calcium Pantothenate; Inositol; Mormon Tea; Sete Sangrias; RNA/DNA Spleen Tissue Factors; Zinc Chelate; Selenium Aspartate. 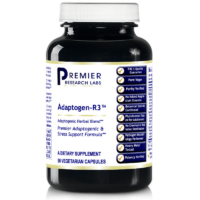 Recommended usage for Adaptogen: 1-2 capsules with breakfast, and 1 with lunch. Start with one per day and increase to 3 if desired. Combine with Ga when needing fatigue support. Read more on Adaptogen here. Other Ingredients: Vegetable Cellulose Capsules ans no additives at all!